The Laszlo Gardony Trio with John Lockwood & Yoron Israel at Mezzrow on May 16 for One Night Only! 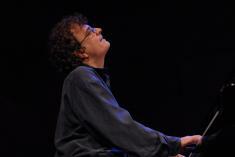 Internationally acclaimed Boston-based jazz pianist and composer Laszlo Gardony is one of the most expressive and technically skilled pianists working in jazz today. " A formidable improviser who lives in the moment" (JazzTimes), Gardony has performed in 27 countries and released a dozen albums on the Sunnyside, Antilles, and Avenue labels during his distinguished, decades-long career. Winner of the Great American Jazz Piano Competition, Gardony has been noted for his "fluid pianism" by The New York Times. The legendary Dave Brubeck called him "a great pianist." 4 stars - "There's a stillness at the center of [Gardony's] music, a distinctive amalgam of central European folk strains, majestic classical piano and improvisational fearlessness. On this recording...Gardony never splinters; he only consolidates, gaining power along the way." "Laszlo Gardony is wonderfully imaginative, his music conjuring up images of busy urban thoroughfares, starry nights in the woods of New England, of hushed audiences in a concert hall, and so much more... Serious Play does in essence, in fact, and in deed, describe this lovely album down to its resonating final chord." 4 stars - "...resonates with a deep and profound sense of understanding."